Over the years, Hong Kong has been proudly claiming that it is one of the safest and most stable cities in the world. However, the ever changing social structure (including family, peer pressure and personal values) will probably bring aboutmore complicated criminality in the community. 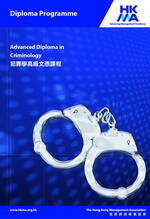 This Advanced Diploma programme will examine the causes of criminality from a theoretical and practical perspective. In addition, the course will look at the consequences of criminal behaviours and how such criminality impacts upon the criminal justice system. Such principles and knowledge will help law enforcement officers carry out their duties of law and order maintenance in a more professional manner, Similarly, those interested in pursuing criminological studies will find the curriculum beneficial. The programme commences in January and May each year, and the application deadline is 2 weeks prior to the commencement date.